Thank you for visiting our online storefront, our goal is to help you find the best tank to fit your needs and deliver it to you at the lowest possible price. 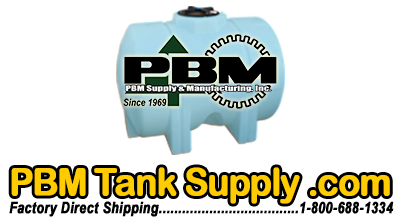 PBM Tank Supply is a leading distributor of Norwesco Tanks and Tank Accessories in North America. We carry tanks from 5 to 15,000 gallons for water storage, chemical storage, septic, cistern, rainwater collection, liquid transport and many more uses. We have 45 years of experience matching the right tank to our customer's needs, if you have any questions about our products, feel free to give us a call at 800 (688) 1334. PBM Supply & MFG., Inc is based out of Chico, California and has over 45 years of experience providing products for the agricultural and industrial markets. We developed PBMTankSupply.com to provide a more economical shipping and delivery solution for our customers. By shipping directly from the factory to our customers, we can cut costs on delivery and storage and pass along the savings to you.